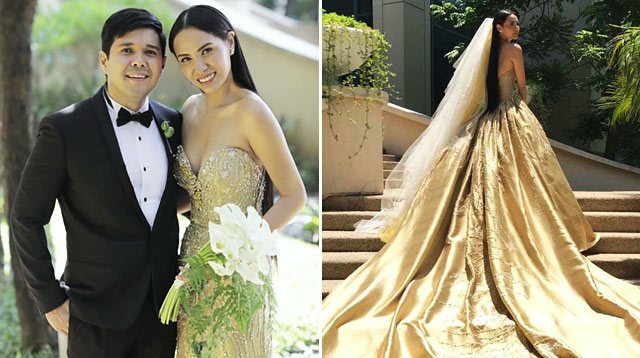 Veering away from traditional white bridal gowns, blogger Divine Lee tied the knot with retail magnate Blake Go in a stunning gold Rajo Laurel wedding dress on August 5, 2017. The bride entered the Cebu Metropolitan Cathedral clad in a shimmering, embellished metallic gown with a sweetheart neckline while carrying a bouquet of white callalilies. Her Rajo Laurel frock boasts a massive train and features an extra long, thin white veil. 1. Divine has been both a client and friend of yours for so long, and when I asked her about her gown, she said, "Bahala na si Rajo!" What was the process of designing a bridal gown for her and how much freedom did she give you? "Having someone trust you so blindly is both inspiring and terrifying. Divine is truly more than a client and we treat each other like family. The last time I had carte blanche on a wedding gown was for my sisters. So it was really wonderful when Divine gave me the freedom to design her wedding gown." 2. Why did she/you choose to do her gown in gold? Could you tell us about the silhouette (that's a mighty big train), beadwork, and fabric? "The gown is actually Divine. It's speaks of her DNA aesthetic completely—form-fitting, close to the body, gleaming with crystals, and a beautiful décolletage. The treatment of the embellishments is that of gold thread embroidery enhanced with marquis-shaped Swarovski crystals in amber tones." 3. How long did it take to make her gown and what were fittings like since she is based in Cebu now? "Divine actually fitted only once! I was so nervous because she had never seen the dress before then. We had been working on her gown for seven months." 4. Did you make anyone else's gown for the wedding? "I made all the entourage members', flower girls, and ring bearers', plus a few of the godparents' gowns." This is Divine's second wedding gown, following her civil wedding last May where she wore a plunging white jumpsuit accented by a thin white veil.